The anti-microbial agent provided by BioCote® remains constant at the surface, interrupting and destroying cells' ability to function, grow and reproduce. It has been shown to inhibit the growth of organisms such as E.coli and MRSA, thus forming an effective part of good hygiene practice. BioCote does not function in the same way as antibiotics and there is no evidence to demonstrate that bacteria have become resistant to BioCote as they can to some antibiotics. 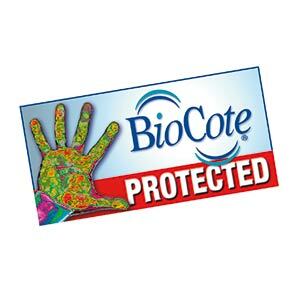 BioCote does not deteriorate and therefore remains effective for the standard life of the painted surface. This reduces the risk of Stormor Shelving users bringing contamination into hygiene critical areas such as food processing, preparation and serving points and patient care areas, as well as into the general working environment. The active ingredient in BioCote is the element silver in the form of silver ions. Silver is a natural antimicrobial, which has been used for many centuries for its abilities to aid in preservation, especially in water systems. Silver is also currently used in the healthcare sector in silver coated catheters and wound dressings. The silver ions are added to materials at the manufacturing stage. This results in an active concentration of silver ions on the surface of the product. “Hospital-acquired infections lead to approximately 5,000 deaths every year” (National Audit Office report July 2004). The silver ions cause functions in the bacteria to break down. This results in the bacteria being unable to reproduce and therefore inhibits bacterial growth. Extensive independent testing has been carried out on a wide range of bacteria including MRSA and E.coli. Products have been tested for the simulated life of the product /material with no significant reduction in the antimicrobial performance noted; therefore the silver ions are effective for the life of the product. BioCote forms part of a second line of defence, with the potential for spreading contamination through manual contact being minimised. Working with Manufacturers, BioCote can offer a complete anti microbial solution incorporating BioCote technology into a variety of product surfaces which are effective against a wide range of organisms. Ideal for office use the Duo shelving range has open or clad backs. Open shelving units with higher storage capacity than Duo shelving. Ideal for archive storage the the Solo shelving range has open or clad backs. For the safe storage of very heavy items.